Have you tried making your own Lumpiang Sariwa with Fresh Lumpia Wrapper from scratch? If not, chances are that you got intimidated with the procedure, or you have limited information on how to make one. If you are one of those who are trying to learn how to make this dish and need more in-depth information, this post and the detailed video below should be able to help. 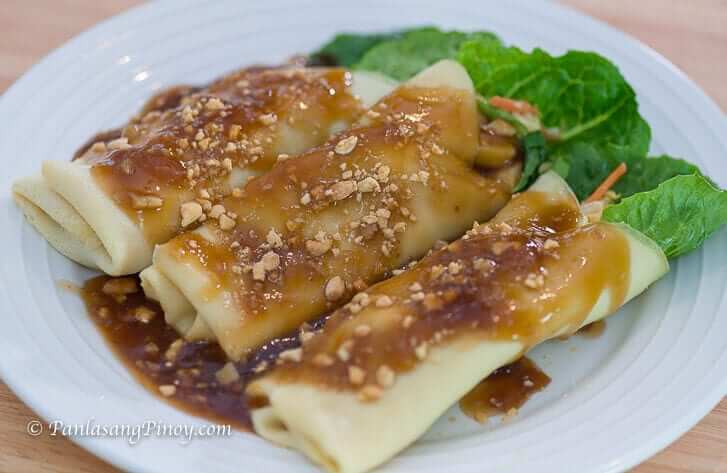 In this post (and video), I will teach you how to cook lumpiang sariwa from ground up. This includes making the lumpia filling (which is composed of tofu, shrimp, and veggies), making your own fresh and soft lumpia wrapper, and making the fresh lumpia sauce. The entire dish involved three major processes in order to build all of its components. Once everything is done, we’ll just assemble the dish and enjoy it. I ask for your patience and attention while viewing the video and reading the recipe. Always remember that the final product is really worth the effort. Besides, you will be earning bragging rights once you are done. I suggest that you read the recipe once, and then head straight to the cooking video below. The video should be able to tell you all that you need to know and learn. Use the recipe as a guide when you are ready to cook. Lumpiang sariwa is one of our favorite Filipino party dishes. This is what I always eat if I want to have something light and healthy. I think that this recipe is more than enough to be able to satisfy your cravings because the final product is really good and delicious. Please make sure to refrigerate the fresh lumpia (and place it in a covered container) if you intend to enjoy it on a later time. This will maintain its freshness. It is recommended to consume it within 4 hours of cooking for best results. Try this Lumpiang Sariwa with Fresh Lumpia Wrapper Recipe. Let me know what you think. Prepare the filling by heating oil in a pan or wok. Saute onion and garlic until onion becomes soft and transparent. Add sweet potato. Stir. Pour water and let boil. Add Knorr Shrimp Cube. Stir. Cover and continue to cook in medium heat for 5 minutes. Remove the cover and let water evaporate. Add tofu and shrimp.Stir fry for 1 minute. Add cabbage,green beans, , and carrot. Continue to stir fry for 3 minutes. Season with fish sauce and ground black pepper. Set aside. Meanwhile, make the fresh lumpia wrapper by beating the eggs in a large bowl. Pour oil and water. Whisk until all ingrediests are blended. Slowly whisk-in flour into the mixture. Continue to whisk until all ingredients are well blended. Heat a non-stick pan. Lightly grease with oil or spray cooking oil. Scoop around 7 to 8 tablespoons of the lumpia wrapper mixture and pour into the pan. Swirl the pan to spread the mixture. Continue to cook in medium heat for 1 minute or until the wrapper is cooked. Note: the fresh lumpia wrapper is done when it gets unstuck from the pan. Remove the fresh lumpia wrapper from the pan. Arrange in a plate. Set aside. Note: perform this step until all the wrapper mixture are consumed. Prepare the Lumpiang Sariwa Sauce by boiling water in a sauce pan. Add soy sauce, brown sugar and garlic. Stir. Dilute cornstarch in 3 tablespoons water. Pour the mixture into the sauce pan. Stir and continue to cook until the sauce thickens. Assemble the fresh lumpia (lumpiang sariwa) by laying a piece of wrapper flat on a large plate. Put a piece of lettuce leaf in the middle of the wrapper and top with the fresh lumpia filling and chopped parsley. Secure the filling by folding the lower part of the wrapper upwards until it reaches the filling, and then fold the sides inwards. Arrange each piece on a plate and top with lumpia sauce and sprinkle some crushed peanuts. It looks so yummy. I will try to cook this recipe. Please do. Let me know how it went. rating…99% actually perfect na ito….honest msarap and very deliciuos pra sa akin…at madaling matutunan kasi ang galing ni mr. chef mag explain hindi masyado mabilis and very clear pa. mamaya gagawa ako pra sa mga anak ko. i am quite sure they will love this food too. thanks to mr. Merano.